Let's start the day with something pretty shall? I think these glass bottles are really pretty don't you? Ferrarelle is a unique Italian company that's been around since 1893, famous for their naturally sparkling mineral water. The Ferrarelle spring is located near the extinct Roccamonfina volcano where rain falls and percolates underground through layers of rock. The rainwater starts a 9,3 miles journey lasting 10 years, during which time it is purified and enriched with precious healthy minerals including calcium, potassium and bicarbonates. At a depth of 9 miles underground, the water encounters carbon dioxide and begins to rise through the strata, reaches the Riardo plain and springs forth naturally into the light of day, creating the renowned and unique Ferrarelle naturally sparkling mineral water. How cool is that? Ferrarelle is launching a new campaign in the US and will soon have their sparkling mineral water distributed nationwide. Here is your chance to have a bootle of Ferrarelle and a bottle of Natia, plain mineral water, delivered to your house for you to sample. Thanks Ferrarelle for sponsoring this giveaway. I would be tickled to receive such pretties at my house. 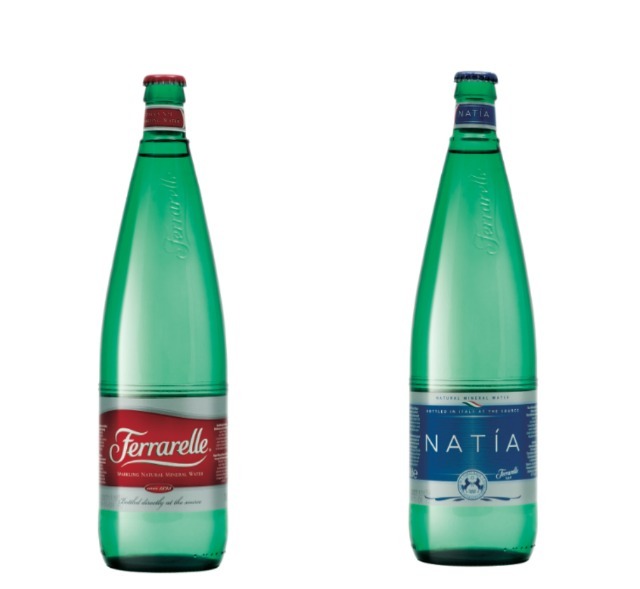 The Prize: A bottle of Ferrarelle Sparkling Mineral water and a bottle of Natia Mineral Water Shipped to a US mailing address only. To Enter: Leave a comment. Any comment will due. Giveaway closes: Midnight PST September 27. The winner will be contacted via email and announced next Wednesday. This giveaway is now closed. The winner is Skyxsky. I do love my bottled water! Anything that comes in a glass bottle seems classier :) I'd love to win this!